Can Decentralization Help Rebuild Indonesia? Indonesia's 2001 decentralization was a "Big Bang," indeed. Much of the apparatus of government was transferred to the regions in the course of the year, the regional share in government spending jumped steeply, and a completely new intergovernmental fiscal system was put in place. Surprisingly little went wrong in the logistics of this radical, hastily prepared move born amidst the political turmoil in the aftermath of the New Order government. But now that the dust is settling on the first year of decentralization, several key issues have started to emerge-some of them touching the very nature of decentralization itself. In addressing these issues, the government needs to carefully balance its desire to maintain a unitary state with the aspirations of the regions, and the opportunities offered by a more decentralized system of government. 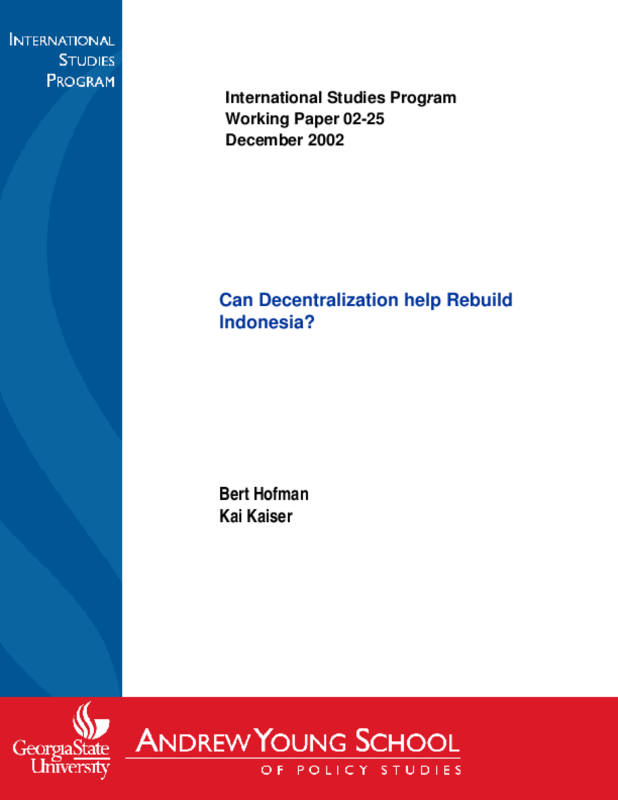 Title: Can Decentralization Help Rebuild Indonesia?